'Breathtaking views' is the 1st impression as you enter this dramatic mountain home. Soaring transom rake windows bring views & light to the center of stunning great room & upper level game room. Huge deck to relax & entertain with creek side serenade from bordering East Fork, Stuarts Fork of Trinity River. 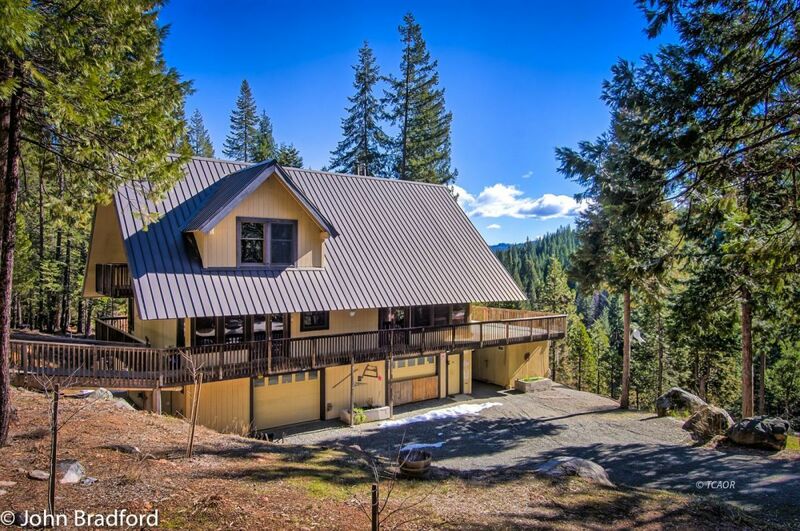 Nestled within a gated community, just one mile from pristine Long Canyon Trail Head in Trinity Alps Wilderness. Home positioned & designed for passive solar benefits. On grid power w/ public utilities district PLUS full off grid solar. Bedrooms & great room feature french doors, each w/ access to covered wrap around deck. Game room w/ extra sleeping options enjoys it's own balcony. Over sized 4 car garage, workshop, generator room, & wine cellar w/ EZ interior access.Tandem 2 car carport, covered wood storage, water storage & plenty of extra parking. Mountain Aire community water, just $100.00 per year w/ no meter. Secondary water via East Fork of Stuarts Fork. So many features, please see attached document for more. Savor year round enjoyment in rustic ambiance w/outstanding craftsmanship & high quality materials; all the while, making the most of priceless VIEWS & SERENADE !